Oddly enough.. over the last few weeks, I’ve received various emails and tweets asking about poly-octave pedal.. but with a small footprint. What was cool.. I was familiar with the T-Rex Quint Machine.. which would work nicely for this solution. Similar to the EHX POG2 or Micro POG, this is a poly-octave allowing for octave up and down. This is more stripped down though, allowing for a single +1 octave and a single -1 octave. Additionally, the Quint Machine also has a +1 5th up knob as well. The signal / effect is manged by a Mix knob. Playing this pedal, the first test I want to see is tracking. How well does this pedal track from notes to octaves. Does the pedal glitch trying to hit those octaves, etc? The answer, the Quint Machine has incredible tracking.. and it’s fast. With poly-octave pedal it’s possible to get faux-12 string tones, organ tones, and solid bass tones. The footprint is an important note. Most poly-octave pedals have a fairly large footprint. The T-Rex Quint Machine is in a single size enclosure (what you’d expect for an overdrive, etc), so this will not eat up your pedal board real estate! As you can see, this is a great little poly-octave in a small enclosure. Very cool. The video shows it’s tracking capabilities. I give this a thumbs up. 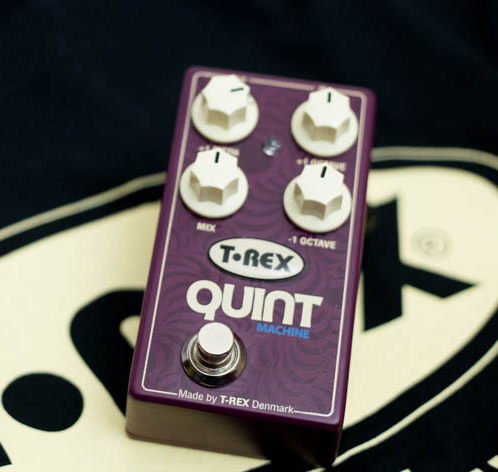 If you’re looking for a great poly-octave, the T-Rex Quint Machine might be a great pedal for you. Let me know what you think of this pedal by commenting below! The pedal sounds great. And it’s pretty expensive.